(Nanowerk News) A team of scientists from Columbia University, Arizona State University, the University of Michigan, and the California Institute of Technology (Caltech) have programmed an autonomous molecular "robot" made out of DNA to start, move, turn, and stop while following a DNA track. The development could ultimately lead to molecular systems that might one day be used for medical therapeutic devices and molecular-scale reconfigurable robots—robots made of many simple units that can reposition or even rebuild themselves to accomplish different tasks. The latest installment in DNA nanotechnology has arrived: A molecular nanorobot dubbed a "spider" and labeled with green dyes traverses a substrate track built upon a DNA origami scaffold. It journeys towards its red-labeled goal by cleaving the visited substrates, thus exhibiting the characteristics of an autonomously moving, behavior-based robot at the molecular scale. The traditional view of a robot is that it is "a machine that senses its environment, makes a decision, and then does something—it acts," says Erik Winfree, associate professor of computer science, computation and neural systems, and bioengineering at Caltech. Milan N. Stojanovic, a faculty member in the Division of Experimental Therapeutics at Columbia University, led the project and teamed up with Winfree and Hao Yan, professor of chemistry and biochemistry at Arizona State University and an expert in DNA nanotechnology, and with Nils G. Walter, professor of chemistry and director of the Single Molecule Analysis in Real-Time (SMART) Center at the University of Michigan in Ann Arbor, for what became a modern-day self-assembly of like-minded scientists with the complementary areas of expertise needed to tackle a tough problem. Shrinking robots down to the molecular scale would provide, for molecular processes, the same kinds of benefits that classical robotics and automation provide at the macroscopic scale. 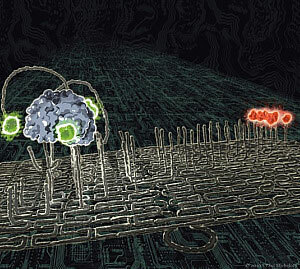 Molecular robots, in theory, could be programmed to sense their environment (say, the presence of disease markers on a cell), make a decision (that the cell is cancerous and needs to be neutralized), and act on that decision (deliver a cargo of cancer-killing drugs). Or, like the robots in a modern-day factory, they could be programmed to assemble complex molecular products. The power of robotics lies in the fact that once programmed, the robots can carry out their tasks autonomously, without further human intervention. With that promise, however, comes a practical problem: how do you program a molecule to perform complex behaviors? "In normal robotics, the robot itself contains the knowledge about the commands, but with individual molecules, you can't store that amount of information, so the idea instead is to store information on the commands on the outside," says Walter. And you do that, says Stojanovic, "by imbuing the molecule's environment with informational cues." "We were able to create such a programmed or 'prescribed' environment using DNA origami," explains Yan. DNA origami, an invention by Caltech Senior Research Associate Paul W. K. Rothemund, is a type of self-assembled structure made from DNA that can be programmed to form nearly limitless shapes and patterns (such as smiley faces or maps of the Western Hemisphere or even electrical diagrams). Exploiting the sequence-recognition properties of DNA base pairing, DNA origami are created from a long single strand of DNA and a mixture of different short synthetic DNA strands that bind to and "staple" the long DNA into the desired shape. The origami used in the Nature study was a rectangle that was 2 nanometers (nm) thick and roughly 100 nm on each side. To build the 4-nm-diameter molecular robot, the researchers started with a common protein called streptavidin, which has four symmetrically placed binding pockets for a chemical moiety called biotin. Each robot leg is a short biotin-labeled strand of DNA, "so this way we can bind up to four legs to the body of our robot," Walter says. "It's a four-legged spider," quips Stojanovic. Three of the legs are made of enzymatic DNA, which is DNA that binds to and cuts a particular sequence of DNA. The spider also is outfitted with a "start strand"—the fourth leg—that tethers the spider to the start site (one particular oligonucleotide on the DNA origami track). "After the robot is released from its start site by a trigger strand, it follows the track by binding to and then cutting the DNA strands extending off of the staple strands on the molecular track," Stojanovic explains. Although other DNA walkers have been developed before, they've never ventured farther than about three steps. "This one," says Yan, "can walk up to about 100 nanometers. That's roughly 50 steps." "This in itself wasn't a surprise," adds Winfree, "since Milan's original work suggested that spiders can take hundreds if not thousands of processive steps. What's exciting here is that not only can we directly confirm the spiders' multistep movement, but we can direct the spiders to follow a specific path, and they do it all by themselves—autonomously." In fact, using atomic force microscopy and single-molecule fluorescence microscopy, the researchers were able to watch directly spiders crawling over the origami, showing that they were able to guide their molecular robots to follow four different paths. "Monitoring this at a single molecule level is very challenging," says Walter. "This is why we have an interdisciplinary, multi-institute operation. We have people constructing the spider, characterizing the basic spider. We have the capability to assemble the track, and analyze the system with single-molecule imaging. That's the technical challenge." The scientific challenges for the future, Yan says, "are how to make the spider walk faster and how to make it more programmable, so it can follow many commands on the track and make more decisions, implementing logical behavior." "In the current system," says Stojanovic, "interactions are restricted to the walker and the environment. Our next step is to add a second walker, so the walkers can communicate with each other directly and via the environment. The spiders will work together to accomplish a goal." Adds Winfree, "The key is how to learn to program higher-level behaviors through lower-level interactions." Such collaboration ultimately could be the basis for developing molecular-scale reconfigurable robots—complicated machines that are made of many simple units that can reorganize themselves into any shape—to accomplish different tasks, or fix themselves if they break. For example, it may be possible to use the robots for medical applications. "The idea is to have molecular robots build a structure or repair damaged tissues," says Stojanovic. "You could imagine the spider carrying a drug and bonding to a two-dimensional surface like a cell membrane, finding the receptors and, depending on the local environment," adds Yan, "triggering the activation of this drug." Such applications, while intriguing, are decades or more away. "This may be 100 years in the future," Stojanovic says. "We're so far from that right now." "But," Walter adds, "just as researchers self-assemble today to solve a tough problem, molecular nanorobots may do so in the future." The other coauthors on the paper, "Molecular robots guided by prescriptive landscapes," are Kyle Lund and Jeanette Nangreave from Arizona State University; Anthony J. Manzo, Alexander Johnson-Buck, and Nicole Michelotti from the University of Michigan; Nadine Dabby from Caltech; and Steven Taylor and Renjun Pei from Columbia University. The work was supported by the National Science Foundation, the Army Research Office, the Office of Naval Research, the National Institutes of Health, the Department of Energy, the Searle Foundation, the Lymphoma and Leukemia Society, the Juvenile Diabetes Research Foundation, and a Sloan Research Fellowship.